Tim and I are heading out for another vacation this upcoming Friday, we are going to Maui (my first time in Hawaii!). Tim's parents have a condo there (they otherwise live in SF) so we are meeting up with them there and we'll stay through the 4th of July. So I've been doing some sewing to get ready for the trip. No, not sewing any beach coverups or fun dresses, rather I spent several hours today working on two baby quilts. My coworker will come back from maternity leave while I'm gone, and I want to have them ready for when she returns. She had twins and was assigned to bed-rest just before we had the office baby shower. Since then I've let the quilts-in-progress languish in the corner. I actually like working on quilts, so not sure why it's taken me so long to get back to these, except that of course it takes time away from my apparel sewing. All that's left is to apply the binding, which will require some handsewing, best done with some TV as entertainment. Good thing Big Love is on tomorrow night. Ha! I just got the whole first season of Big Love to watch while I knit. 'S good, isn't it? Darn! Nicegirl was in NYC recently. I should have asked her to look. Maybe I'll just call and order. I think my aunt may be disgruntled. 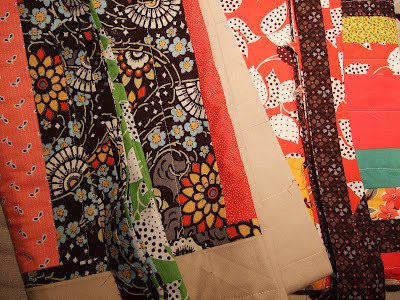 Those fabrics are so much more fun than what I used on my last quilt. Have a great time in Hawaii. Hawaii was wonderful. I hope you enjoy your time there too. Do let us know your finds if you decide to go fabric shopping. Hawaii is beautiful! We stayed on the Big Island. Have fun! You will love Maui. Did you know you can go fabric shopping there and for real cheap too? Check out my blog under April. I was there and shopped at a couple of places and added links. Have fun! Thanks for the tip, Linda! I found the links on your blog. I will keep my eyes peeled for those stores. Have fun in Maui! I was just there this last November. We stayed in Kehei (sp?) Beautiful beaches. If you get a chance to drive the road to Hana, do so. It's a looong windy drive, but the Hana Hotel is lovely for a light lunch or dinner. Wish I were going to Maui - getting away from this Seattle crazy weather. Have a great time!